I stood motionless, staring at the primary portal that had just become active. I was too late... We missed our one chance to end it once and for all by seconds! All around me, the scientists were cheering, but I phased it out; there was silence all around me, and I felt like there was only me and the master portal in existence. Nothing else mattered now... We had worked so hard to reach this point, and sacrificed so much, but it counted for nothing... My attention was drawn to the master portal now; the cheering and commotion going on around me began to phase back in. A loud surging sound like charging electricity became audible and everyone quietened down. The sound became louder and louder, until it felt like it was buzzing inside my own head! Then from overhead a large flash of light erupted from the ceiling; a crackle of electricity as a bolt of pure energy raced down the conducting rod, and into the frame of the master portal. We all watched, stunned, as the portal slowly began to activate. The frame crackled with a mysterious, blue energy as the portal surface slowly washed into place, like the tide coming into land. It began as a faded, purple shimmer which grew in intensity before our very eyes! When it reached the same colour and hue as the others, there was a huge release of energy from the portal, and the tower began to violently shake! The cheers and celebrations of moments before had now been replaced by screams of terror and fear! I ran back up the stairs before anyone else could reach it, trying to keep my footing despite the immense shaking. The tossing of the structure around me did not subside or become reduced as I made my way higher up the tower, back to the base. If anything it felt like it was getting worse, and now the air around us rippled with the sound of something indescribable! The shaking increased intensely and I was having trouble getting up the stairs, but I managed to make it back to the base. There was no-one left there any more, presumably they had all ran out to protect themselves from anything falling. Dashing to the exit, I ran directly over to where the Lone 7 had stayed while I had gone into the tower. They were still there, but their faces showed expressions of horror and disbelief. A powered down the CPD, and I slowly came into view before them. "Syeonyx! What happened? Did you use the Ender Keystone? Is the portal imploding?" I shook my head and explained what I had seen when I entered the chamber. I began to start on the primary portals when there was an almighty crash coming back from the tower behind me! Looking back, I could now actually see the master portal floating in mid-air, hovering above a hole it had just punched through the base of the tower. We stood there and stared in horror, with absolutely nothing we could do. We were powerless to intervene in any way; the portal hovered on the spot; the blue energy that surrounded it crackled and spat, setting fire to anything it touched, before it was quickly extinguished by the downpour. "What now? How do we destroy that thing!?!" "We can't... It's active... We're too late..."
The screeching of stressed metal grew in volume; looking up to the top of the antennae, we could see that the portal had warped the entire tower. The top was now leaning at a precarious angle to the West, and it was still slowly bending. A moment later, there was an ear-wrenching scream as the iron tower sheered off from the base, and began to fall to the ground below. There were many guards running around below it, trying to organise everyone. In the commotion they hadn't spotted us creep closer, but they also hadn't noticed the tower. It continued to fall until it struck the ground with such force we were all knocked off our feet! The guards that had been around that area were now no longer visible; the dust cloud kicked up didn't look like it was going to settle soon, and I'm glad it wouldn't. A flash of lightning struck close to the tower again, drawing our attention back to the portal. What do we do now? We can't destroy it, and we can't interfere with it once it was active! 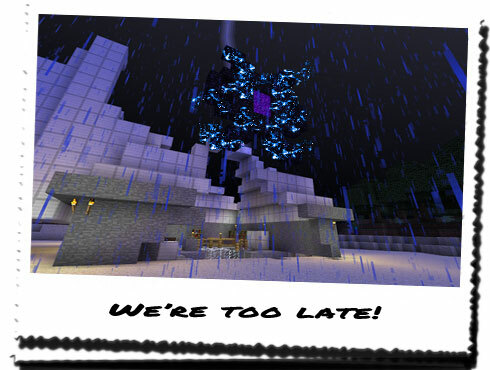 Right in front of us, the Enderman materialised out of nothing, hovering a few inches above the ground. It turned to look at the portal, but there was no emotion expressed physically that we could see. It turned back to us, looking directly at me. "The portal is active. All of the evil from the Nether can now spill into our world freely, corrupting our world. There is nothing that can be done to destroy it now." "What do we do then!?! We can't just walk away, we need to do something!!! What about the Keystone? Why won't that work any more!?!" "The Ender Keystone was designed to use the energy of the portal against itself while it its early stages of activation. The energy delivered to it is of this world and can only destroy it while it is inactive. However, the portal is now active, allowing the energy from the Nether to spill into ours. The blue incandescent energy flow around the portal is this energy. With the Nether energy protecting the portal, not even the Ender Keystone can work." We watched as the portal continued to hover on the spot. The blue tendrils of energy coursing and coiling around the air close to it like many thousands of snakes trying to get loose. All around the guards and scientists stood staring at it, dumbfounded at the sight. I doubted HoN Co. knew this was going to happen, or if they did, only the higher echelons were aware. Everyone's reactions showed that they never expected this to happen. They were told it was a way for them to harness limitless quantities of free energy from the Nether and utilise it in our world. The master portal was the only way to get the energy into our world, and it seemed this had been the only remotely true part of what they had been told. "What happens now then? How long will it take before the Nether begins to merge with our world?" "We are not sure. It may take hours to start merging, but when it begins, the entire world is doomed. The power from the Nether will cause exponential decay, turning everything to ash and dust." From the portal we could see activity; the surface of the portal itself began to shimmer as something began to pass through it. It was a Ghast! Then another, and another! They were passing into our world! Then behind them two strange fire creatures we had seen back in the Nether! "These creatures are not right for this world. They have ventured through the portal out of curiosity, not as a form of attack. When the master portal was activated, the Nether counterpart rose from its place and is now acting as a beacon, drawing the attention of every living creature within many thousands of miles. It may take hours to begin merging but by then many of these creatures will have passed through." From below we could hear gunshots as the guards and Elite soldiers began to fire upon the intruding creatures. They seemed to do little in the way of damage, and instead only drew attention to themselves. One of the strange fire creatures began to float down towards one of the guards; he fired an entire clip into it, with seemingly no effect. The creature lurched forward, setting fire to him, and despite the torrent of rain, he continued to burn for many moments until he fell to the floor. We turned to look in the direction of the voice. From below the portal appeared the figure of a man dressed in black. Only his eyes were different; a red glow emanating from the slit that was exposed, which coursed throughout the rest of the body in a a strange vein-like pattern. "We know this man. He is the evil one. He is the one that set all of this into motion."